This article is about our first Digital Art of the Possible event in 2016. More information about this year’s event on 4 October 2017 is available here. More than 130 delegates from across the NHS and local authorities, along with 50 exhibitors, attended our Digital Art of the Possible event on 22 September at the newly refurbished Ashton Gate Stadium in Bristol, run in collaboration with NHS South, Central & West Commissioning Support Unit (CSU) and NHS England. The event was designed to stimulate thinking around the potential offered by emergent digital technologies and to act as a speed horizon scan for health and care leaders from across the South to consider some of the innovations and opportunities available that might support delivery of Sustainability and Transformation Plans (STP) and Local Digital Roadmap (LDR) priorities. Watch our short film of the day. Deborah El-Sayed, NHS England’s Director of Digital and Multi-Channel Development, opened proceedings with a rousing introduction, which set the scene perfectly for a day where minds were opened and new relationships brokered. According to Janina Cross, Chief Digital Information Officer for the West of England AHSN, two main themes have emerged as a result of the day. 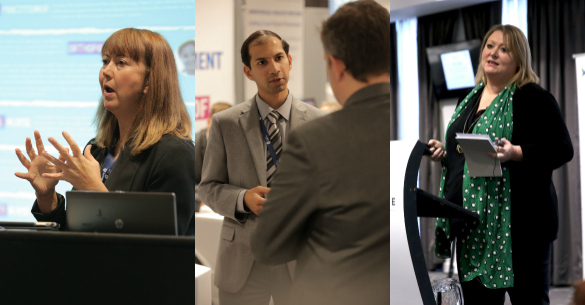 “It was really exciting to see so many business-to-business conversations as well as STP and LDR stakeholders from across the region exploring the ‘digital art of the possible'”, commented Janina. “Two key themes have come out of our discussions and workshops. Firstly there is the need for more operational transformation stakeholders to be given the opportunity to explore the ‘digital art of the possible’ so they too have the chance to identify products and services that might help accelerate the STP progress. Secondly we need greater visibility of the detail within STPs and LDRs so that businesses can understand the best way to develop and position products and services to better meet the needs of future service delivery. Andrew Fenton, Associate Director for Digital Transformation at NHS South, Central and West CSU, adds: “In one packed day, the Digital Art of the Possible brought to life a wide range of ways that technology can improve person-centred care and prevention across whole communities.